For many people, summer is the only available moment to walk the Way. The holidays are here, as well as friends, reunions, family plans… It’s a perfect moment to start the route! Doing it in July or August has only one problem: the heat. A lot of people think that the heat is not too much and do not take precautions, but you should be safe and do the Way to Santiago with heat taking all the necessary precautions. This is how you can you prepare before doing it. To prevent problems, the first thing you can do is avoiding the sun. One of the commandments for a pilgrim is to get up early. In this case the hardest hours of sun are at midday. That’s why walkers start soon and arrive around 1 PM to hostels. This has more benefits, like easily finding a spot for you. If you do the Way to Santiago with heat, shade will also be your ally. In many parts of the route it is difficult to look for it, especially on stretches of road. But as soon as you see some, protect yourself and walk without the pressure of fulll light. Keep this in mind when resting. It will always be more relaxing to stop under a tree than in a plain. Unless you suffer a very bad summer, assume that you will do the Way to Santiago with heat, especially in August. Don’t be irresponsible and use all the resources you have to combat it! Externally, you should start examining your clothes: try not to wear dark garments with colours like black or brown, as these tones attract the heat. Use light colours. It is also important to use a hat. The head needs the most protection! Another point is suncream. Apply it before getting out of the hostel, as you’ll be taking care of your skin if you cannot find shade or don’t have a hat. Use it even if you don’t feel the heat: during the Way, you’ll exposed to the sun for many hours and should protect your skin. “Hydrate” is a word that you should keep in mind if you do the Way to Santiago with heat. Walking many kilometers under the sun dehydrates our body. This is due to the high temperatures, the many hours that we walk and the exercise that we’re doing. How can we solve this problem? Firstly, it’s always important to have a water bottle with you. It’s going to be your best friend! We should drink constantly, every 15 or 20 minutes. It’s essential to drink even when we’re not thirsty. Many walkers wait until they have the necessity, but this means that you have already started to dehydrate. Prevention is important! Another recommendation is to have isotonic drinks. This will be helpful to hydrate our body in an intensive way, because they have a lot of sugar, as well as plenty of minerals. In case of dehydration, drinking is the most important step. 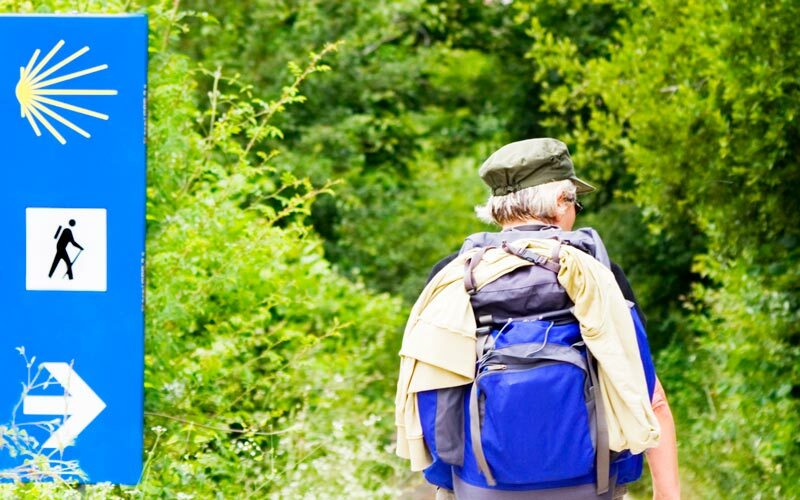 Burns, cramps, sunstrokes or heat strokes can arise too when doing the Way to Santiago. A sunstroke can be detected through the fever, sweats, nauseas, exhaustion or blurry vision; in this case cooling off is going to be the most advisable option. If a pilgrim suffers a heat stroke, go straight to the doctor. 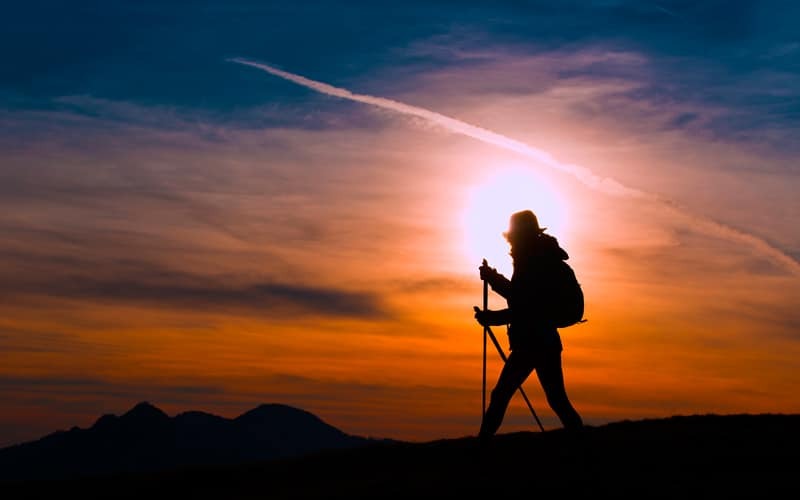 Doing the Way to Santiago with heat is an option as valid as the rest, but you should always keep in mind that your body is your tool to finish the route, so you have to take care of it. 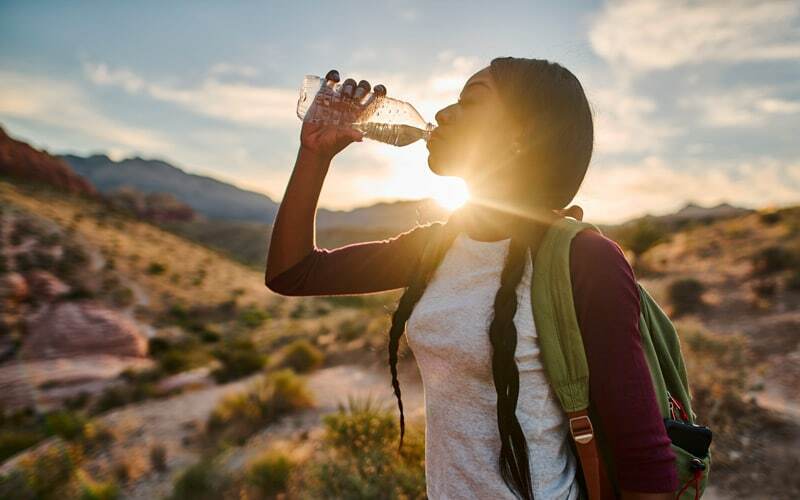 Control the sun and have a water bottle with you: these are the most important steps!